Brakes produced a vastly improved performance in an entertaining clash with their fellow promotion-chasers at a misty Phillips 66 Community Stadium, with Paul Holleran noting encouraging signs of a return to their early season swagger, writes Paul Edwards. The festive period is rarely a fruitful one for Leamington and 2016 had been no different, a disappointing draw with Stratford followed up by a defeat with the last kick of the game at Banbury, but in the this contest they looked much more like their old selves. Chippenham frustrated their hosts early on with some well-timed blocks, skipper Greg Tindle denying Callum Gittings a shot at goal after he had worked himself into a good position, while players and fans alike were left frustrated when referee Ed Pidduck brought play back for a free-kick after Courtney Baker-Richardson had kept his feet to stumble clear of two challenges for a run at goal. Joe Magunda then saw a shot blocked as the ball pinged around the Chippenham penalty area from the resulting dead ball. An inch-perfect first-time ball forward from Richard Taundry saw Richard Gregory shape to shoot only for Rhys Baggridge to intercept with a well-timed block. Baker-Richardson then set up Ahmed Obeng but the striker’s shot lacked the power to trouble Chippenham’s former Frome Town keeper Darren Chitty. Ahmed Obeng is unable to divert the ball home after a first-half save from Darren Chitty. The visitors, who had gone close when Taundry had cleared from the goal line as the ball ricocheted around the box, took the lead in the next attack. The ball was fired in from the left, returned back into the six-yard box from the right and David Pratt, who had scored the winner when the two sides met back in August, was on hand to steer home from close range. Magunda thundered a header wide from a free-kick as Leamington continued to move the ball around smartly. Connor Gudger raced into space down the left, slipping the ball square for Obeng, who helped it on for Baker-Richardson to drive a shot across goal. The same player was left wondering how he had not levelled things up in the final action of the first half when his powerful goalbound header was diverted away by a fantastic reaction save from Chitty. Edwards’ downward header from a corner was saved early in the second half, but the goal that Leamington’s play deserved arrived after Chitty could only parry a stinging low drive from Edwards. Gudger picked up the loose ball and dug out a perfect cross from the touchline and Baker-Richardson simply could not miss, nodding in from almost on the goal line. Unfortunately, Brakes were unable to build on that and find a winner, but the game continued in an entertaining vein. 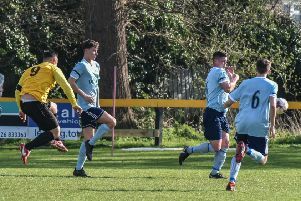 Gregory was well off target with a free-kick, while Matt Smith launched an ambitious effort towards Breeden’s goal from just inside the Leamington half which dropped on to the roof of the net. Further efforts from Edwards and Gittings were saved by Chitty, while Taundry was set up for a vicious drive that rippled the side netting. Breeden was only called into action once more, but it was an important save as he dived at the feet of Chippenham striker Pratt to prevent another potential last-kick calamity. And despite seeing two points go begging, home boss Paul Holleran was pleased with the reaction to a disappointing holiday period. “Our first-half performance was probably the freshest we’ve looked for maybe six weeks,” said Holleran. “There were signs of our early season form where we really bopped the ball about. We were getting players on the ball in the right areas, and if it wasn’t for some very good goalkeeping and poor finishing we’d have been ahead at half-time, but Chippenham are a very resilient team and they are always good games. “The two boys up top, if you give them half a chance they will stick it away, which is what David Pratt has done. “It was a little bit harsh that because I thought we played well but we got in at half-time, sorted ourselves out and got ourselves going again, and I thought we showed tremendous character, we were intense in our play and didn’t let it affect us. “I thought the way we moved the ball around in the first 20 to 25 minutes of the second half, stretched them and got the goal, prior to that we had some really good passages of play. We’d have loved to have won it. Chippenham deserved a point for a good away performance, and it was a good away performance, but from our point of view if we were a little more clinical in the final third we could have gone on and won the game. “I was delighted with individual performances. Some of the work we’ve been trying to do over Christmas, I could see it happening on the pitch. Leamington: Tony Breeden ©, Richard Taundry, Connor Gudger, Jack Edwards, Joe Magunda, James Mace, Courtney Baker-Richardson, Callum Gittings, Richard Gregory (15 Ryan Rowe, 77), Rob Thompson-Brown, Ahmed Obeng (16 Darren Pond, 83). Subs not used: 12 Ben George, 14 Tom James, 17 Nathan Olukanmi. Chippenham Town: Darren Chitty, Dan Bowman, Nuno Felix, Gary Horgan, Greg Tindle ©, Rhys Baggridge, Alex Ferguson (15 Michael Pook, 77), Matt Smith, David Pratt, Andy Sandell, Matt Jones. Subs not used: 12 Jon Beeden, 14 Mario Mateus, 16 Will Richards, 17 James Rae.